"If aliens invaded, would you fight back?" After narrowly escaping his harrowing ordeal in Oasis, our plucky but unlucky ER nurse finds himself awash in chaos again as UFO begin to make very public appearances over major U.S. cities. Things only get worse when the aliens begin to attack. Our hero might just have the key to defeating the extraterrestrials, but he’ll have to face gangsters, a very belligerent talk show host, his new girlfriend’s dad, a group of trigger happy survivalists, and the US Army first. 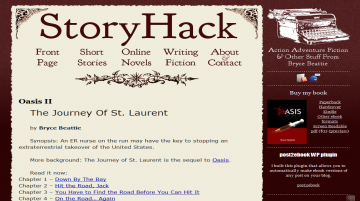 The Journey of St. Laurent has not been tagged yet. Help others find The Journey of St. Laurent by tagging it! The Journey of St. Laurent has not been reviewed yet. The Journey of St. Laurent has not been recommended yet.